IF YOU HAVEN’T been to hospital in recent times as a patient, but you are a holder of private health insurance, there’s a facet to such medical treatment you may not be familiar with. Upon arriving in hospital you will be asked whether you would like to sign a Private Insurance Patient Form. The result of this is that if you choose to sign, you are waiving your right to public treatment. ‘But why would I want public health care when I’m paying for private?’ you may ask. The reason you may want to ignore the form is the discrepancy in price between the two. Private health care is charged at a rate of €813 per day. Public care is charged at €80 per day, capped at €800 for a full year. Both are charged through your insurer, despite the fact public care is funded via general taxation. That’s not a typo. Private care is 10 times more expensive than the public variety. And unless you know that you can be guaranteed a private or semi-private room, the treatment you will receive is exactly the same. Even if you are unlucky enough to be lying on a trolley for a matter of days, if you’ve signed the form you’ll be billed at the higher rate. 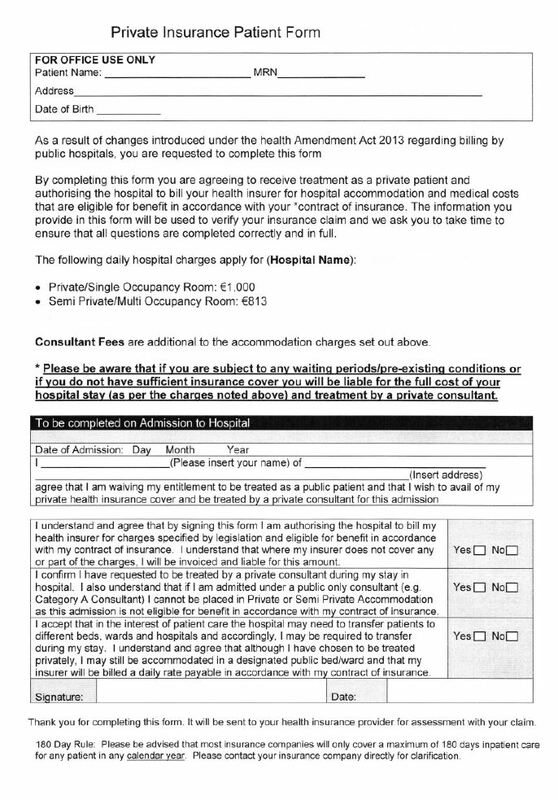 This issue has its roots in the Health Amendment Act which was passed by the Oireachtas in 2013, and which in effect sees patients with insurance being charged a private rate for a hospital stay regardless of the treatment they receive – if they sign the form. The problem is to be found in the form itself – arriving to hospital is a time when naturally people are likely to be in something of a vulnerable state. Signing a form they don’t necessarily understand may be the last thing a person is expecting, certainly assuming it is their first such visit, and there are very real repercussions for doing so. Further confusion can be added to the situation by the fact that oftentimes, in anecdotes heard by TheJournal.ie, those placing the form beneath a patient’s nose are not necessarily entirely familiar with its true nature either. Budgeting for health is a headache that every government has to deal with. In 2013, the amendment (which also affected the Nursing Home Supports Scheme and charges for long-term residential care, amongst other things) was effectively used as a way to shore up a budget deficit in the Department of Health. Before the introduction of the amendment, if you stayed in a public bed, you paid the lower public rate. In seeking the permission of private policy holders to charge them (via their insurer) the higher rate, the last government was seeking to raise in the region of €45 million a year (this figure was contained in a letter from the Department of Health to the chair of the Insurance Ireland health council on 29 November 2013). In reality, as Minister for Health Simon Harris told Dáil Éireann last November, that figure worked out as being approximately €196 million between July 2015 and July 2016. This means that, while the individual patient may not see the costs involved in any concrete manner straight away, they will still come back to bite them in a way they can’t help but notice – their premium. Recently Irish Life Health wrote to its customers giving them a tutorial regarding the waiver form, ostensibly to keep them ‘informed about their rights as taxpayers’. Which is all well and good but the implication seems clear – if you’re going to get the same care regardless of whether you sign or not, don’t have your insurer foot an unnecessary bill. Industry body Insurance Ireland conducted an Ipsos MRBI nationwide poll on the subject in January. It found that 65% of adults surveyed had no idea that the form they were being asked to sign waived their right to public treatment. Of those admitted to a public hospital in the previous 24 hours, just 30% were aware of the form’s purpose. 62% were unaware that private charges for those signing the form are 10 times greater than the public rate. The vast majority of those asked said they consider the process to be unacceptable – 82% of those with insurance said as much, and 73% of those without insurance agreed. “It is important that patients understand what they are being asked to sign when presented with this form in A&E,” says Kevin Thompson, CEO of Insurance Ireland, adding that the poll “confirmed that there is a lack of public awareness of the practice or indeed the cost implications of health insurance customers waiving their right to public treatment”. We believe that asking private health insurance customers to pay twice for a service they are already entitled to, once through taxation and again via their health insurance, is not fair or equitable and amounts to double taxation. Speaking to RTÉ’s Today with Seán O’Rourke last month, Harris acknowledged that the impact of the act had “actually gone too far”, and said that it was “time to review the policy… hospital by hospital to see the impact of it”. “The idea of throwing a sheet of paper in somebody’s face and they’re vulnerable, sick and waiting in a crowded emergency department and saying ‘sign that’ is not acceptable and that is why I have asked to review the policy,” he said. “The Department’s statistics and analytics unit is currently analysing data regarding bed-type occupancy in public hospitals during the period 2012 to 2016 and this analysis is near completion,” a spokesperson said. So that’s how insurers and the government feel about the issue. But what about surely the most important demographic – the patients? “It’s something that’s a great source of frustration,” says Dermott Jewell, policy adviser with the Consumers’ Association of Ireland. There is no question that this is one of the reasons why private health insurance is so expensive in Ireland. The disparity of cost between the two is absolutely extraordinary and ridiculous – it’s a one-size fits all charge. What if you enter a hospital and sit beside a bed for a few hours? The bill is still the same. Jewell raises another serious issue – the fact that insurance is not necessarily guaranteed at all Irish hospitals. Which means that if you waive your right to public treatment, you may end up getting stuck with a mammoth private bill yourself. “When it comes time to go to hospital, the insurers would say ‘you need to ring us beforehand, so that we can confirm that if you opt for private you’re covered’,” he says. Unfortunately most people will not do this – they want to get to hospital as soon as possible. But then if you opt for private you’ll pay what’s in the contract if it turns out that the hospital is not covered by your insurer. “Irish Life Health will pay for the cost of treatment that is appropriate to the cover a customer has under their health insurance plan. If a customer signs a waiver form in a hospital not covered under their health insurance plan, the decision on whether they will need to pay the private charge will be between the customer and the hospital,” a spokesperson said. Insurance Ireland’s Thompson meanwhile guarantees that if a patient chooses not to sign the form “they can be reassured that their insurer will still cover their costs”. But no mention of what happens if they DO sign and the hospital isn’t on a list of covered institutions. “It’s a very, very difficult situation,” says Jewell, adding that one solution would be to find a way for hospitals to provide a bill based on costs per the standard of care provide – after that care has been delivered. It may be unacceptable from a consumer point-of-view, but they’ll say ‘we asked a patient was he covered, he said he was and signed the form, what are we supposed to do?’. At present then, it seems the best advice someone heading for hospital can follow is to be as sure as they can be that signing the Private Insurance Patient Form on admittance will see them receive the private care they’re paying 10 times the public rate for, either by asking the hospital on admission or, if possible, in advance. If the standard of care will be no different, it is hard to say how doing so makes any sense. Email “Why you should be very wary of signing this insurance form on arrival at an Irish hospital”. Feedback on “Why you should be very wary of signing this insurance form on arrival at an Irish hospital”.